OPINION: Bradford’s Telegraph & Argus Write WCSL Piece… Manage To Make It All About A Man! Yes – it might be a Women’s Cricket Super League (the clue is in the word “women’s” chaps!!) 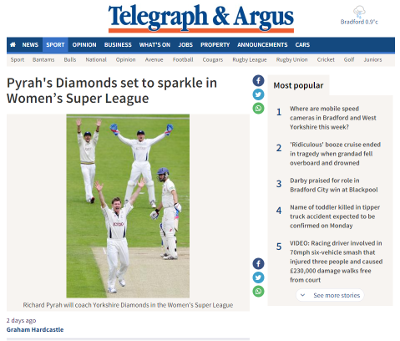 but the Telegraph and Argus have managed to make it all about a man – the headline, the (only) photograph and the byline – all focusing on coach Richard Pyrah. And quite right too: if you start giving women headlines and photographs, they’ll want the vote next… and then where will we be? Lancashire have been allowed to keep their semi-official “County Championship” name, although it isn’t supposed to be the same team, and there is no guarantee in theory that they will have the same players. Surrey will brand themselves as “Surrey” rather than “London”; which will no doubt draw-in supporters of Surrey’s men’s team… but may also exclude cricket fans north of the river! Loughborough have been permitted to extend their existing “Lightning” brand, which is already used by their Superleague [sic. – one word!] netball team.